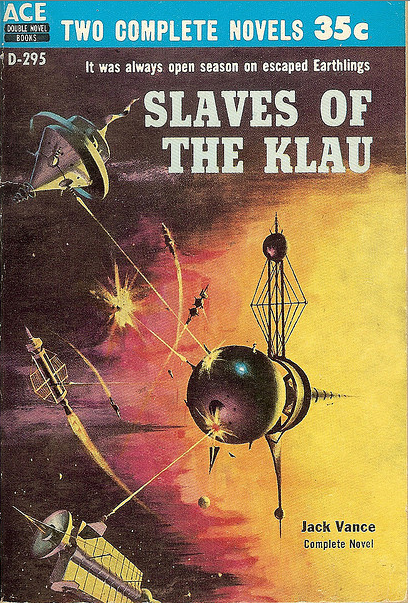 I spend a substantial amount of time looking through the sci-fi publisher catalogues of Ace, Pyramid Books, Dell, Doubleday, Signet, Ballantine, etc for both books to read and interesting covers that fit into various themes for my Adventures in Science Fiction Cover Art posts (INDEX). 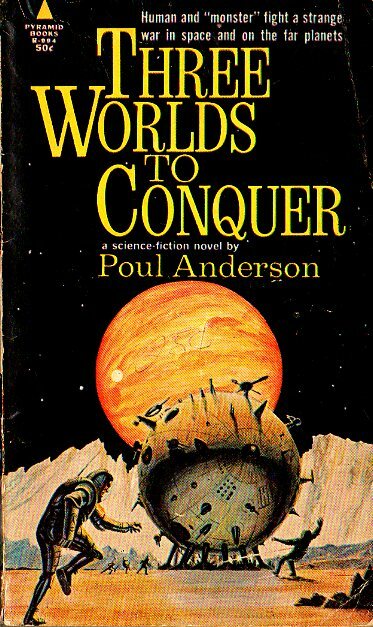 While perusing I’m occasionally baffled by covers that I’ve sworn I’ve seen on other books — and lo and behold, publishers sold art to different publishers, often lesser-known and unable to commission their own work (a few recycle art from 20 years earlier!). Or, the same publisher would simply re-use an image for a later publication. Often, the artist wouldn’t be credited for the later edition so tracking the duplicate art is dependent on the mechanisms of memory! 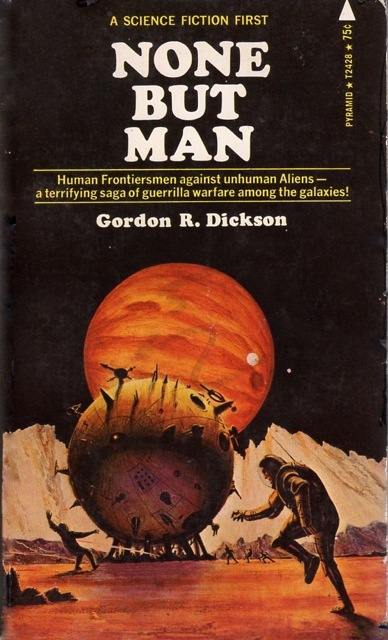 Sometimes they employ little tricks to make the cover look *different* — by, uhh, flipping the image (for see above, Jack Gaughn’s original cover art for Anderson’s Three Worlds to Conquer and below, recycled art for Gordon R. Dickson’s None But Man ). 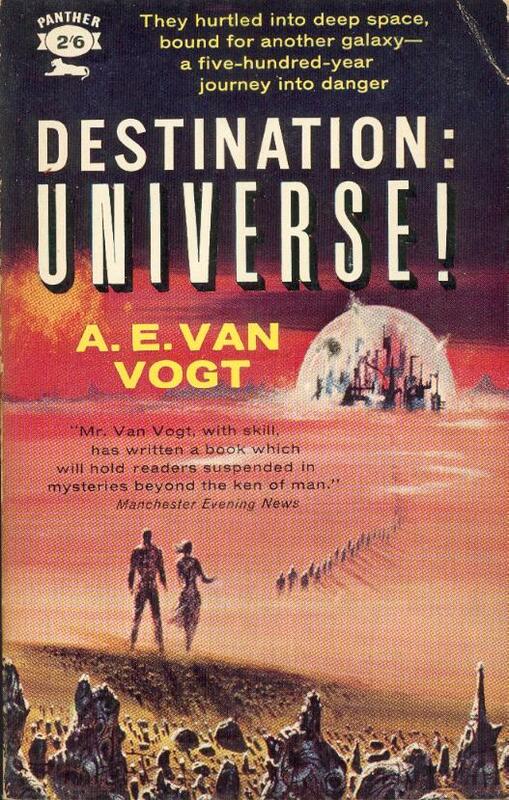 Or, desaturating the color (Powers’ cover for The City at World‘s End and the later book, van Vogt’s Destination: Universe). If you know of any reused cover art please let me know! This is not meant to be a complete list — I have vague recollections of at least four other duplicate covers I’ve seen but, I don’t remember the titles of the later books). 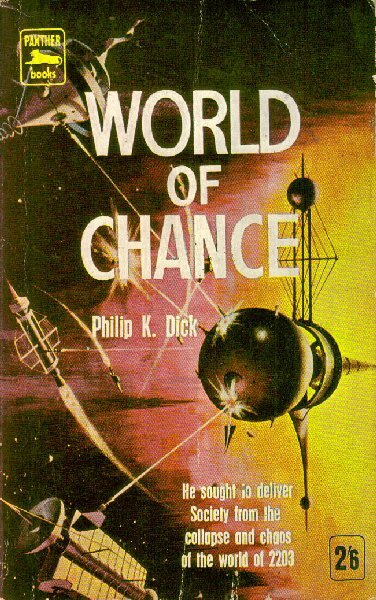 For similar posts see, Adventures in Science Fiction Cover Art Index. This is a trick employed by publishers for years! Many of the differences between titles may actually come down to different printers causing the appearance of different colouring which may not have been intentional at all. I doubt they even cared back then if the painting was accurately colour correct! If the image has been cropped, flipped or radically changed in colour, then I’d say it was intentional. Some of the old pulps, crime, action, cowboys etc, used to employ artists to paint over or copy existing paintings but with subtle differences so as to avoid paying the original artist! I suspect you might be right about the desaturation — it was just a guess on my part. But the flipping is definitely intentional! hehe. 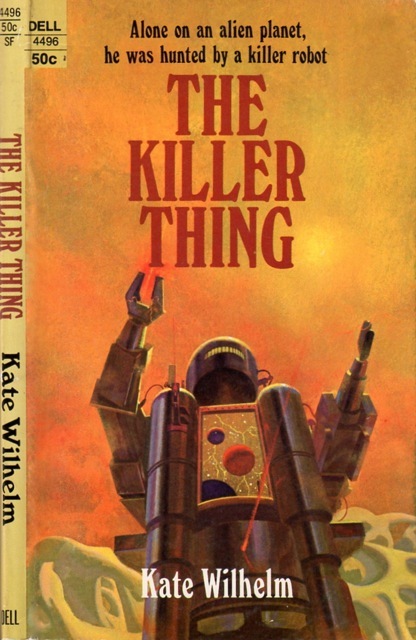 I feel bad for the robot on Killer Thing and Another End, because I’ve read both of those books, and they are both pretty weak. Haha, I’ve heard terrible things about Wilhelm’s Killer Thing…. 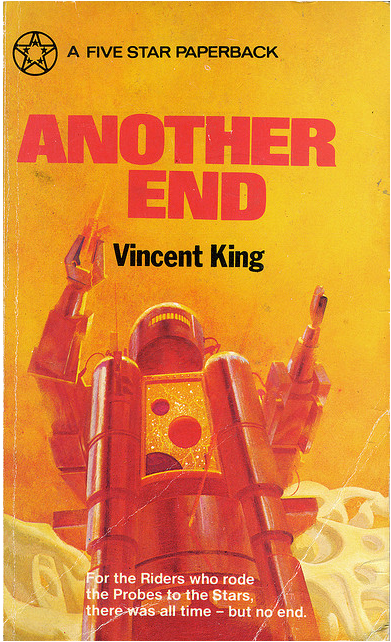 And I hadn’t heard of Vincent King until I found that cover. 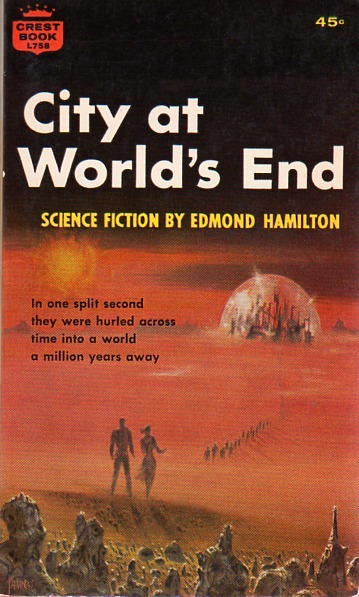 I had never heard of Vincent King either when I bought Another End for like a quarter at a church flea market or something like that; mine has the Dean Ellis cover. I wrote a merciless review of it on Amazon; while I didn’t like Killer Thing, I can imagine someone thinking “Kate Wilhelm has used the Frankenstein template to levy a masterful indictment of the white patriarchy and the way its imperialist capitalism exploits women, native peoples and the environment.” I can’t even imagine a defense of Another End. Until you wrote “Thead chooses to hunt Adamson with a Thompson sub-machine gun” I thought the premise didn’t seem that bad! But yeah, the rest, well, and the Thead = Death bit, definitely dooms the novel before I even pick up a copy…. Wait a sec — Does Wilhelm manage to put a semi-relevant social spin spin on a normal robot trying to kill someone trope? Or, is it so heavy handed that it’s painful. Why is it that the recycled, re-used, re-issued cover always has worse graphics than the original version? I think it might have to do with the fact that lesser publishers (who apparently are less interested in graphics) bought the art from Dell, etc. Re Killer Thing: I thought the attack on Western imperialism way too heavy handed, and also too long-winded; there was surprisingly little of what I bought Killer Thing to get: a guy being chased by a robot in a desert. If Wilhelm had had like 1 page of anti-Western propaganda for every 10 pages of tense survival action, I might have liked it, but its more like the other way around. However, some Swiss guy gave it five stars at Amazon, and says the ending, which I called a cliched deus ex machina, is one of his favorite endings ever. The clichéd deus ex machina ending would annoy me more than a heavy handed attack on Western Imperialism — hehe. I think it’s kind of interesting that a robot attacks guy on planet story is decked out like that… But obviously, I trust your opinion — and the book isn’t high on my list! 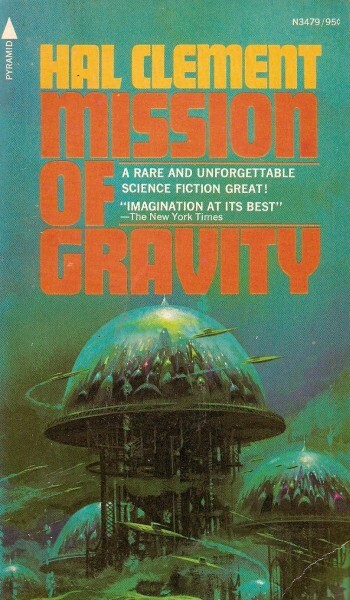 How the domed city is at all relevant to “Mission of Gravity” escapes me. There are no cites at all in the story, and no aircraft. 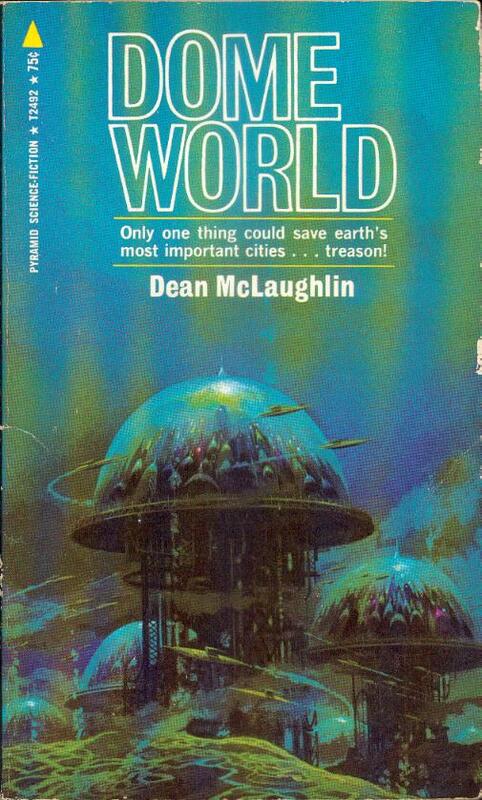 Precisely, the entire idea of the post is that earlier art (in this case it was originally for the Cooper novel) was used for another unrelated novel. Probably to save money…. I know that. Shows the guy who picked the picture just didn’t give a crap. Didn’t know or care what the book was about. Presumably he had a file of art he could use; just took whatever was on top of the stack. I’ve “repurposed” art, but only when it was actually relevant in the new context. Ehh, I don’t take as much offense to it as you seem to…. seems a bit like the regurgitated space opera battle scenes that seem to cover every current SF novel (a generalization of course — hah).